In the beginning of May 2016, S., a resident of the West Bank village of Sur, returned to his village and immediately noticed heavy smoke billowing from his land. 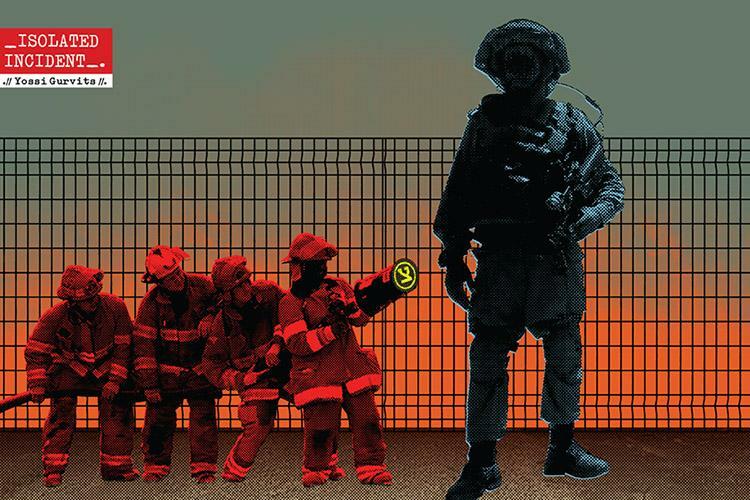 Normally in such cases one hastily summons the fire fighters; but we are dealing with the West Bank under Israeli military rule, so things tend to get complicated. S. grows olives on his land, where he owns around 100 trees. He lives off the olive harvest, estimating that he produces between 200 to 250 olive oil drums — each one weighing 17 kilograms — per season. Unfortunately for S., Israel built the settlement of Sil’it right next to his land. It did so by using an old schtick: it seized the land for “security needs” in 1977, created a NAHAL outpost (a military unit with a dual purpose – both combat and settling land), which gave the place the look of a military outpost. On August 29th 1979, the government quickly declared it to be a civilian settlement. The timing is important: at the time, the High Court of Justice was deliberating the Elon Moreh case and would eventually rule (Hebrew) that the practice of building settlements on land seized for military purposes is illegal. At that point, however, the court had yet to issue its groundbreaking ruling. The distance between S.’s land and Sil’it is only 150 meters (some 450 feet). In 2004, under the cover of the Second Intifada, Sil’it’s security fence was expanded to includes S.’s land. Now there is both a fence and gate between him and his land, meaning he can no longer reach his land – no one disputes the land is his – unless he receives a prior permission from the military commander. In 2009 his land was set ablaze; he believes Israeli civilians were responsible. During last year’s olive harvest, S. managed to obtain his workers permits for three workdays – yet the IDF prevented them from accessing the land. S. kept trying to get them permits to work the land, but the IDF bureaucracy is slow, and in the meantime the harvest season passed. Half a year later S. was standing and watching his land burning from across a locked gate. He called the Palestinian District Coordination Office (DCO), which in turn called Palestinian fire fighters. But the IDF did not allow them to enter the land; it is unlikely we will ever know the reason for the refusal. But the wind, damn it, the wind — it does not discriminate between Palestinian or Israeli property. It is indifferent to documents and ethnicity. And the wind turned the fire toward Sil’it. The distance, you will remember, is only 150 meters. And then S. beheld a wondrous sight: as the flames consumed his land as Palestinian fire trucks were prohibited from aiding him, Israeli fire trucks swiftly reached the other side of his plot and quickly began dowsing the flames. The fire trucks weren’t sufficient, so a short time afterward two fire fighting planes flew overhead and extinguished the fire, which nearly reached the gates of Sil’it. Unlike the wind, Israeli soldiers can perfectly discriminate between land owned by a Palestinian and land seized by Israelis. And there you have it, the whole occupation in a nutshell.